Many well-meaning people set up faucets in the hope of earning an income from them, but only a small number make enough of a success of it to stick around. Others simply set out to scam those who use faucets in good faith expecting a pay out at the end only to be disappointed when the fraudster disappears with their Satoshi. So it’s a nice feeling when you stumble across a high paying faucet/mining/game site that actually does what it says on the tin and hands you your satoshis when they’re due. The site I’m talking about is Cointiply. We’ve previously written a review on this site based on our initial experiences, but this is an update after our first successful pay out. We started off by simply claiming a few coins from the faucet, which we gradually built up using the loyalty bonus (1% per day, max 100%). We then experimented with other earning methods, such as watching adverts in return for coins, and generating referral traffic, to build up our haul of coins more quickly. It wasn’t too long before we reached the 35,000-coin withdrawal level and at this point we decided to see if Cointiply was true to its word. Note, we’re talking about coins here. The site offers its own currency, the value of which is also shown live in dollars and BTC. The 35,000-coin threshold allows you to withdraw directly to your faucethub account, but you’ll need to collect 100,000 coins to withdraw directly to your bitcoin wallet. At the time of writing both methods were free. After entering our faucethub address we didn’t have long to wait – within a matter of hours our satoshi landed in our account exactly as promised. The whole process was seamless and there were no awkward steps to complete before getting our bitcoin. Whoever has designed this site has clearly done so with the non-technical user in mind. We were left wishing we had waiting for a few more coins to drop in before withdrawing as it’s quite a high threshold, especially if you’re not able to secure many referrals. 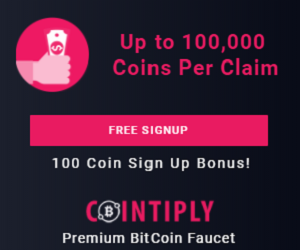 That said, with the myriad of different ways to earn Cointiply has to offer, it’s not half as difficult as other sites to reach a withdrawable amount, especially if you claim every day and build up a loyalty bonus. So there you have it. Our experiences so far suggest that Cointiply is a 100% legit and paying website that is professionally run, high-paying and honest. We hope they manage to succeed in keeping the site going and building up the earning options as this is definitely one of the best faucet/video/mining sites out there are present. They recently conducted a survey asking users what other features they’d like to see so it seems they have plans for the future which is great news. Our one criticism of the site is that the mining game, while profitable, is quite complex if you’re a complete newbie. A more detailed explanation of how to get started is need if they want to attract more participants. 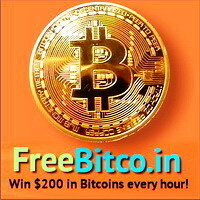 Other than that, we can thoroughly recommend Cointiply to anyone looking to earn free bitcoin without any initial outlay and learn more about the exciting world of cryptocurrencies.